In February 2005, the elders of four villages in the Kanyenyeva area in the Dowa district in Malawi, Africa started an orphan project with 125 orphans. Their purpose was to help feed and support the increasing number of local orphans and their caregivers. They contacted Shadreck Chikoti, a Malawian native, and asked him to help them. After much prayer, Shadreck agreed to become their volunteer Executive Director. He and several other people formed a Non-Government Organization (NGO) in Malawi called the Kanyenyeva Ministries (KM). Over the years, Kanyenyeva Ministries started Kanyenyeva Orphan Care Ministry (KOCM) and several businesses which support the feeding program at the orphan project. In the fall of the same year, Malawi was in the midst of a drought. KM was having a difficult time providing the maize (corn) and beans for the children’s meals at the orphan project. Mr. Chikoti then emailed Joy Jones, a member of First English Lutheran Church (FELC) in Mansfield, Ohio. He had served as an interpreter for a trip that she had taken in 2002 with African Orphan Fund (African Orphan Fund has since become part of Word and Deed). Mr. Chikoti explained that the newly formed orphan project was running out of food to feed the children. The food shortages were so bad that the children’s performance at school was being affected. This information was brought to the congregation of FELC and the congregation was captured by their need. Enough money was raised during the Advent season of 2005 to feed the orphans until their harvest time in May, 2006. KM was also able to purchase fertilizer and seed for the orphan project and for the orphan’s care givers with those donations. FELC has continued their relationship with KM since that time. A committee was formed at FELC to help support KM through prayer, with finances and by educating others in the US about the plight of the orphans. In 2005, with the financial support of FELC, KM increased the number of orphans that they help to 250. After a few years, the FELC committee felt that even more orphans and their care givers could be helped through forming a 501(c)(3). 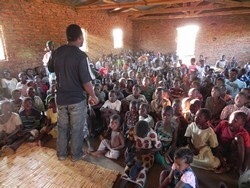 In February, 2012, Malawi Orphan Care Project became a registered non-profit organization in the state of Ohio. In September, 2014, we were granted 501(c)(3) status retroactive to February, 2012. In 2012, Immanuel Lutheran Church (ILC), in Crosby, MN, and in 2013, Trinity Lutheran Church in Monroeville, Ohio joined MOCP and with their help KM now feeds about 800 orphans.